Astronomers have taken their first 3D look at a gigantic filament of dark matter, an invisible cosmic structure that can only be detected by its gravitational effects it has on its surroundings. The universe is thought to be structured like a tangled web, with long strings of mostly dark matter intersecting at giant galaxy clusters. Since dark matter cannot be seen directly, these filaments are difficult to observe. But using the Hubble Space Telescope, astronomers have managed to probe one of the elusive cosmic strands in 3D. The researchers sought out a 60 million light-year strand of dark matter around the massive galaxy cluster MACS J0717. The galaxy cluster is one of the largest yet seen and is about 5.4 billion light-years from Earth. Ebeling and his fellow researchers analyzed images of the cluster from the Hubble Space Telescope, as well as Japan's Subaru Telescope and the Canada-France-Hawaii Telescope. 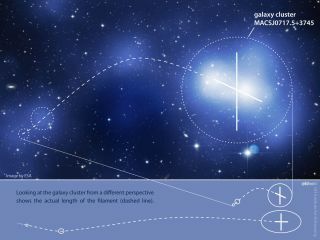 They also used gravitational lensing techniques to map extent of the massive dark matter filament. This enormous image shows Hubble’s view of massive galaxy cluster MACS J0717. The large field of view is a combination of 18 separate Hubble images. The location of the dark matter is revealed in a map of the mass in the cluster and surrounding region, shown here in blue. The filament visibly extends out and to the left of the cluster core. Albert Einstein's general theory of relativity holds that massive objects, including dark matter, warp space and time around them, causing light passing through to travel along a crooked path. Filaments thus distort the images of galaxies in the background and the researchers were able to convert the image distortions into a mass map for the string of dark matter extending from MACS J0717. The team found that the filament stretches back from the core of MACS J0717, almost along our line of sight from Earth. With a length of 60 million light-years, the filament's sheer size is extreme, researchers said. If it is representative of other strands, then these strings might contain even more dark matter than theorists had predicted. The study will appear in the Nov. 1 issue of Monthly Notices of the Royal Astronomical Society.